I recently read a fantastic book called Manufacturing National Park Nature by Keri Cronin, which looks at how photography influences our expectations of national parks. It’s a seriously interesting read, with lots of pretty photos and postcards of Jasper from decades ago. The book was released in 2010, and at the time I imagine social media wasn’t having a huge impact on people’s travel expectations. In 2010, I was a red haired Hayley Williams wannabee (uhm, it’s 2018 and things haven’t changed that much - my hair is orange instead) who was begrudgingly switching from the abandoned ship that was Myspace and moving over to Facebook. Which I hated. I think my first status update was something typically passive aggressive and emo like “I don’t even want this but no one’s on MySpace anymore.” Instagram was launched at the end of 2010. Flashforward to 2018, and social media is pretty much all about the ‘gram. As a photographer, I love Instagram because it’s so inspiring and helps me improve. As someone who loves travelling, I have a love-hate relationship with the wanderlust it gives me (I love it, the ol’ bank account does not) - but I can’t help but wonder how it changes people’s expectations of a place. In Manufacturing National Park Nature, Keri talks about the way that marketing photographs and postcards are shot so that there are very little people in the photo. We see those photos and expect we’re going to somewhere pristine, untouched, and quiet. And I think that’s something a lot of us are guilty of promoting on social media as well, whether we’re doing it consciously or not. 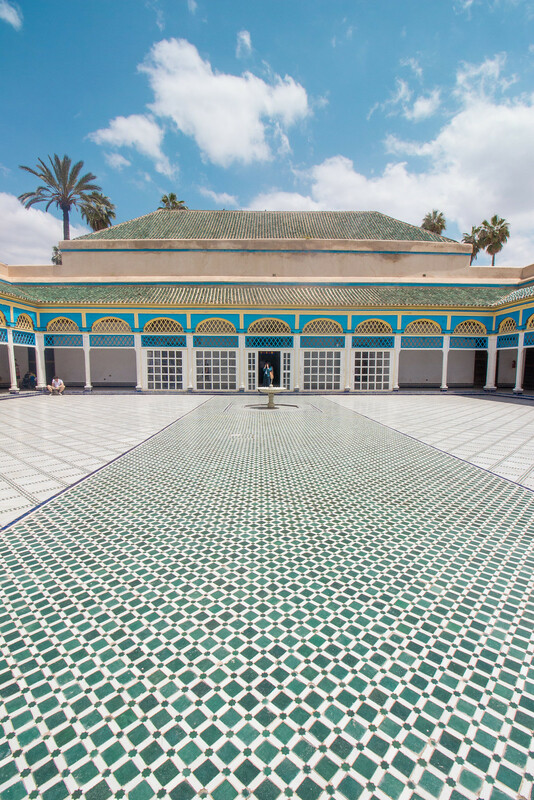 Let's take this photo of Bahia Palace in Marrakech. You can see a couple of people in it, but maybe you would see this and expect the place is quiet. And judging from the photos of it I saw online before I went, I thought it would be quieter. What you don't know is that behind me are loads of people and I somehow got lucky and everyone moved out of the way as I was about to take this photo. Believe me; Bahia Palace = not quiet. I think this is a really interesting discussion point. I definitely don't visit places now expecting it to be exactly as it was portrayed on Instagram or on blogs, because I know there have probably been people photoshopped out. Or they used a tripod to get rid of everyone from the scene. Or they waited and waited until the stars aligned and everyone got out of the photo. I don't hold that against any photographers. I like my landscapes to look pretty empty in photographs, but I don't expect them to be like that when I visit anymore. I'm not sure how obvious that is to people who aren't photographers, though. What does bug me is when I see people promoting something unsustainable. When I see a photo someone has taken where someone is posed in a place they shouldn’t be, it annoys me. I am one of those people who will not walk on the grass if there’s a footpath - ask Daz, he is forever asking if we can walk on “this piece of grass” to annoy me because I am so weird about it. I don't dispute that sometimes, from a photographic point of view, the ideal place to pose someone or take a photo from might be off the trail; if there are signs asking people to stay on the trail, you’re contributing to the destruction of that place. To simplify, if someone sees a big Instagrammer post a photo taken off the trail, other people are bound to do the same to get that amazing shot because they think it must be ok. Plus, they want an incredible photo. And that makes me sad. We visit places to explore and learn more. We don't visit with the intention of damaging it, and I think it's easy to forget how fragile some of this environments are. If more and more people visit, something as seemingly innocent as straying from the marked trail can easily destroy vegetation and habitats. We can all do better. I could waffle about this for hours and I'm beginning to wish I could do a second dissertation because I would love to carry out a study on how social media impacts people's expectations and behaviour while travelling. If anyone wants to fund me to do that, I'm waiting. I take payment in cash, peanut butter noodles, and coffee (but, peanut butter noodles don't pay rent or for Netflix, so...). What do you think? Has Instagram ever influenced your travel expectations? Did it let you down?